Managing critical power within a datacentre environment requires a complete analysis from the building incomer to the point of power distribution. Often the last ‘leg’ of the power path is overlooked but this particular aspect is becoming more and more important. The point of power distribution provides an ideal opportunity for both power management and energy efficiency monitoring. Whether the datacentre provides purely enterprise or cloud facilities or Colocation services that are charged out to clients, accurate power monitoring and granular control are now of vital importance. Modern datacentres provide a capacity related service and must be able to respond to fast changing demands and enable server utilization. Whilst critical power products like uninterruptible power supplies and their associated switchgear can be used to monitor power consumption and energy efficiency as a whole, only intelligent PDUs (power distribution units) can provide the granular control and security that allows monitoring at the socket level. Eaton’s latest range of ePDUs takes power management to another level. The latest range of ePDUs incorporates a number of features that make management and control and easy function within datacentre and comms room environments. The latest Eaton ePDUs allow mass configuration and firmware updating to reduce overall facilities management costs. Their low form factor allows easy access to hot-swap fans and power supplies within server racks and colour-coded sockets make it easy to identify power groups and circuit breaker controls. Energy usage metering is of vital important off course and the latest ePDUs can monitor kWh consumption amongst a range of other factors to within +/- 1% accuracy. Sophisticated monitoring down to the load level allows load balancing, spare capacity identification and as important – billing accuracy. Eaton PDUs are also designed to be easy to install. They use tool-less button mounting and can be used with a wide range of cabinets, including those from Eaton. They have a lightweight aluminium chassis for easy handling, that can dissipate heat easily and provide excellent grounding connectivity. IEC sockets are the Achilles heal of many power distribution units but the Eaton ePDUs have this problem solved. 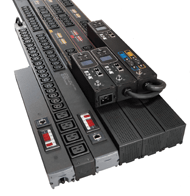 Inferior PDUs can suffer from loose connections or accidental disconnection leading to sudden server power loss. The Eaton ePDUs have integrated IEC outlet grips that work with standard IEC cables and do not add any additional bulk to the form factor. As temperatures increase in datacentres governed by the ASHREA envelope, modern hot-air containment isles can reach up to 60 degrees Centigrade. Eaton PDUs can work up to this temperature and even provide options for temperature and humidity monitoring to help identify ‘hot-spots’ and cooling issues. The final point on Eaton ePDUs covers communications and agility. This latest generation of power distribution unit, have rotatable LCD panels and local facilities for setting IP addresses and reading alarms. Connections can also be daisy-chained together to reduce infrastructure installation costs by up to 75%. Managing critical power within a datacentre environment requires a complete analysis from the building incomer to the point of power distribution. Often the last ‘leg’ of the power path is often overlooked but this particular aspect is becoming more and more important. The point of power distribution provides an ideal opportunity for both power management and energy efficiency monitoring. Whether the datacentre services purely enterprise or cloud facilities or Colocation services that are charged out to clients, accurate power monitoring and granular control are now of vital importance. As temperatures increase in data centres governed by the ASHREA envelope, modern hot-air containment isles can reach up to 60 degrees Centigrade. Eaton PDUs can work up to this temperature and even provide options for temperature and humidity monitoring to help identify ‘hot-spots’ and cooling issues.